We spent the evening at the West Georgia Hot Air Balloon Festival in Villa Rica. Most kids, when they run out the door to go to something like this, get excited about the activities such as batting contests, pitching contests, and hot air balloon rides. Not my kids. They got ready to go then grabbed their camera bags, SD cards, re-chargeable batteries, and of course, their cameras. We pulled in to the Villa Rica Sports Complex just a few minutes after 5:00 and were directed to the lower field where they provided free parking. The balloons were not set up yet, as they were only scheduled from 7 – 9, so we walked up to the football field where they had most of the other activities set up. There was face painting (25 cents), two inflatable jump things for the little ones (mine are too big for that now), the Braves batting and pitching area, a bean bag toss, balloon animals, the concert stage (piped music, no live performance that early, although Tropical Steel Vibes was really good later in the evening), and the food concession stands. After watching the “Sit Means Sit” dog training demonstration, we walked to the upper baseball field to see the two dozen antique tractors they had on display by the 2-Cylinder Club. We got to sit in front of the fan that someone was nice enough to bring too, so we got to cool down a bit before we went back down the hill. After a bite to eat at the “Dinner’s Ready” restaurant (which by the way was the only thing we paid for, and yet had to wait an extremely long time for), we watched the balloons fill up and take to the sky. There were a total of 15 balloons. The ReMax balloon and another one flew by faster than I could get my camera set up, but I got photos of some of the other ones (you can see them at my flickr page at http://www.flickr.com/photos/michaeltbarrett/sets/72157621851989015/ ). Only five balloons remained “tethered”. Three of those that remained tethered were giving rides the entire time from 7-9pm, and the lines moved rather quickly. The yellow diamond balloon was letting people climb in and then glowing for photo opportunities. 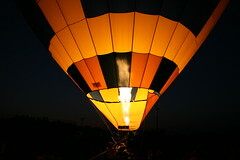 The remaining balloon was demonstrating the glow of the burners and such. The balloonists did a great job explaining how things worked, talking about what they do, and allowing everyone to get up close and personal during the entire “tether and glow” session. As I said at the beginning of the post, we had a great time. I did have to pay for the food (which was expected) but everything else we did this evening was free and the kids came home and went straight to bed because they want to go back in the early morning to see the race. I guess whether or not someone had a good time depends on what they were expecting for the price they paid to attend. For us, it was priceless.